Last year’s Deadly Ink introduced me to a lot of great writers, and I’ve been fortunate to host several of them at The First Two Pages already: Teel James Glenn, Carol Gyzander, and James McCrone. 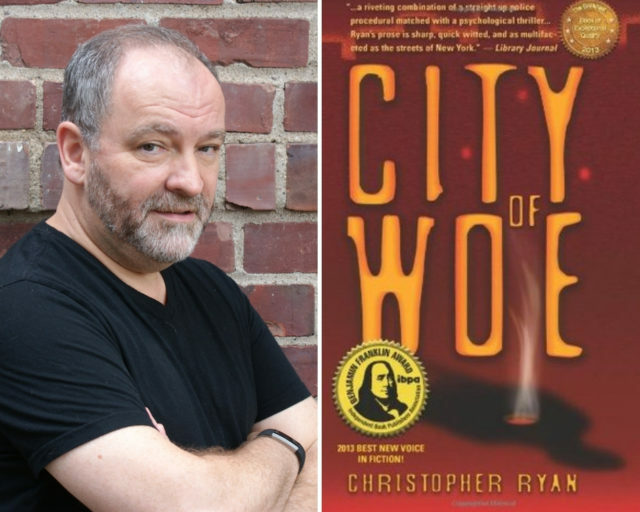 Today, Christopher Ryan offers another essay—and a very special one, examining both the first version and the final version of the opening pages to his novel City of Woe. Not only is Christopher a fine novelist but he’s also accomplished in several other directions: journalist, screenwriter, actor, director, producer, and teacher. He’s written YA fiction and comics as well, and he works with Alex Simmons on the podcast Tell the Damn Story. I was very grateful to be a guest on that podcast recently—a fun conversation Chris and I had in the hallway at Deadly Ink! For more information on his work, check out his website here—and enjoy the essay below!